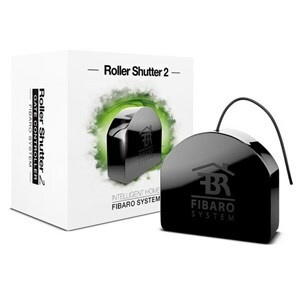 The FIBARO FGR-222 Roller Shutter 2 is an evolution of the popular FIBARO FGRM-222 sensor. The smart device provides you the flexibility to control your electrical shutters, awnings, venetian blinds and garage doors from anywhere in your home. In other words, it can control any device that is powered by an AC electric motor. The insert turns standard electric installations intelligent using Z-Wave wireless technology, and provides you the flexibility to automate your home for maximized energy savings. That means can now configure your FIBARO HC2 controller to automatically close your blinds to preserve heat inside during winter, and open them up during summer. The tiny roller shutter module also features automatic calibration, so that you can precisely position the blind. Additionally, it also includes a power metering facility to help you measure your power consumption. The new version has the largest terminal for accepting two cable 1.5mm2, which makes installing FIBARO FGR-222 easier. It has also been shaped round to meet the safety standards.